In light of the risk Florence poses to the U.S., we’re publicly releasing our morning briefings on our blog. Check back daily for more updates. We are also providing a small sampling of our tropical weather graphics as we continue to track Florence. While Tropical Storm Florence continues to weaken across South Carolina this morning, this system continues to be very dangerous with extreme rainfall, flash flooding, and storm surge. Unfortunately five deaths have occurred due to impacts from Florence. According to WXII-TV, about 100 people were awaiting rescue in New Bern as of this morning, but almost 400 have already been rescued. Almost two feet of rain has already fallen in Newport, NC, at the National Weather Service office. 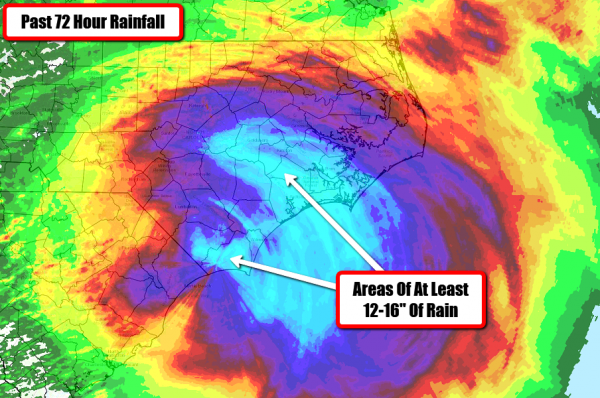 This rainfall total is quickly approaching the all-time rainfall record from a tropical system in the state of North Carolina. 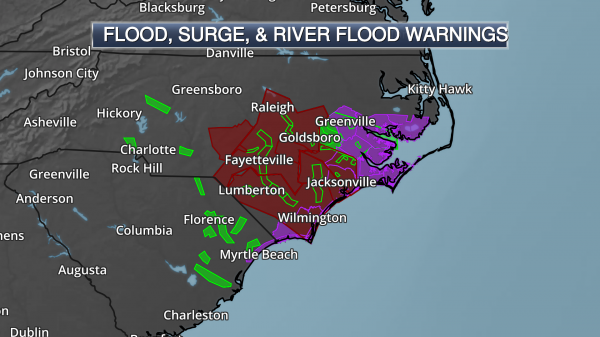 Extreme rainfall will continue across the Carolinas through the weekend, with an additional foot or more of rain possible – especially across parts of North Carolina. In areas hardest hit, rainfall totals of 30-40” will be possible. This heavy rain will continue to produce catastrophic, life-threatening flash flooding and river flooding across parts of the Mid-Atlantic. 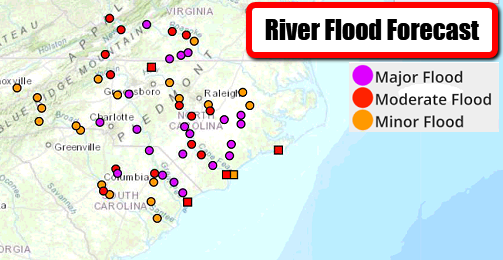 Some of the river flooding could approach records set during Hurricane Matthew from 2016 or Hurricane Floyd from 1999. 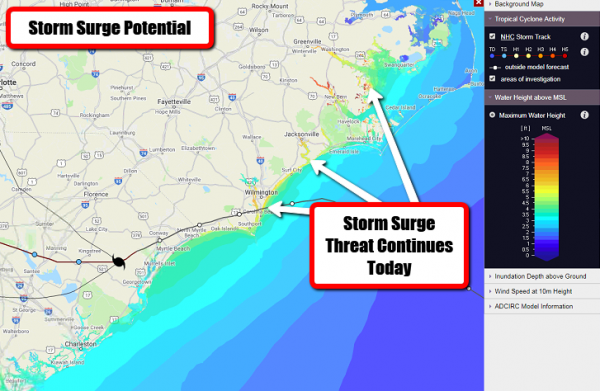 Storm surge will also continue to be a threat today across parts of the coast, with a storm surge of 3-5 feet possible from Cape Lookout to Cape Fear and along the Neuse, Pamlico, Pungo, and Bay Rivers. 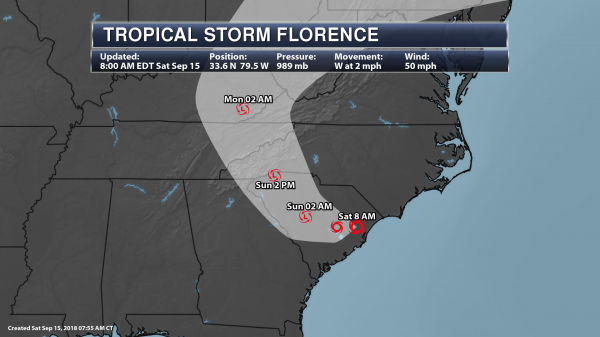 Florence As Of Saturday Morning. Tropical Storm Florence continues to slowly weaken as the storm sits just inland this morning, moving very slowly across parts of eastern South Carolina. As of the 8 AM ET update from the National Hurricane Center, Florence was moving to the west at 2 mph, sitting 25 miles west of Myrtle Beach, SC, or 45 miles south-southeast of Florence, SC. Florence had sustained winds of 50 mph. These were in effect due to major flooding that was occurring across these counties due to the extreme rainfall, with reports of 15-25” of rain in spots. Numerous water rescues were ongoing. Wind Gusts So Far Today. Some strong wind gust over 50 mph continue to occur across the Carolinas this morning. Recent wind gusts have included 51 mph at Wrightsville Beach, NC, and at a NOAA Buoy at Frying Pan Shoals, NC. Strong wind gusts are expected to continue throughout the day across the region. Power Outages. 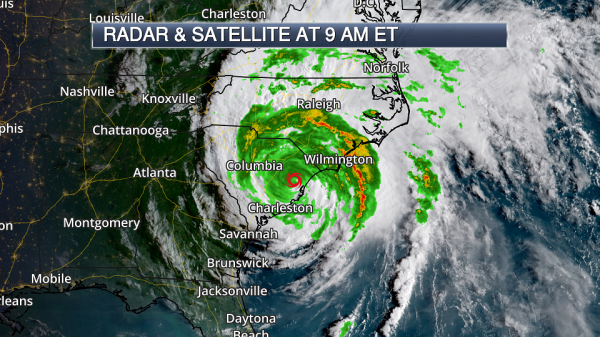 Over 900,000 customers across North and South Carolina are without power due to Florence this morning. 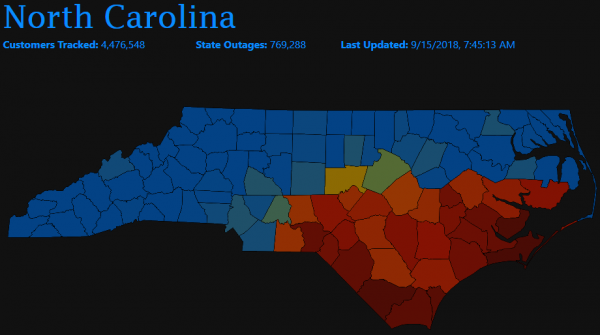 The most is across North Carolina, with over 769,000 outages, mainly across eastern and southeastern portions of the state. In South Carolina, most of the outages are in northeastern portions of the state. You can view this map and links to local power companies at poweroutage.us. Florence Track. Florence will continue to slowly track inland and weaken over the next couple days before finally picking up forward speed late in the weekend. This system will continue to sit over parts of the Carolinas into Sunday before moving into Kentucky by Monday morning and Pennsylvania Tuesday morning. While Florence will continue to pose a storm surge threat today, heavy rain will remain a threat for the next several days across the expected path of the storm. Southern and central portions of North Carolina into far northeast South Carolina…an additional 10 to 15 inches, with storm totals between 30 and 40 inches along the North Carolina coastal areas south of Cape Hatteras. This rainfall will continue to produce catastrophic flash flooding and prolonged significant river flooding. Remainder of northern South Carolina into western North Carolina and southwest Virginia…5 to 10 inches, isolated 15 inches. West-central Virginia into far eastern West Virginia, north of Roanoke and west of Charlottesville, 3 to 6 inches, isolated 8 inches. These rainfall amounts will result in life-threatening flash flooding and river flooding, along with an elevated risk for landslides. Flood Concerns. 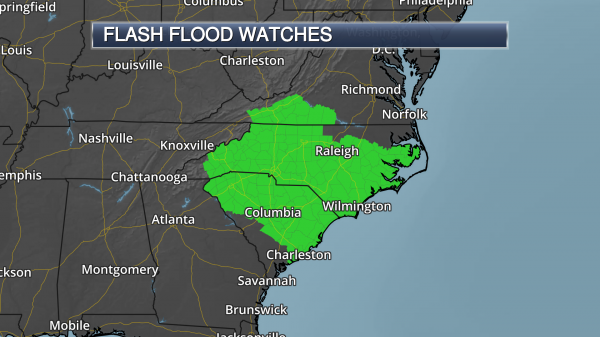 Numerous Flash Flood Watches remain in effect across parts of the Carolinas and Virginia due to the heavy rain potential associated with Florence. Record River Flooding Possible. 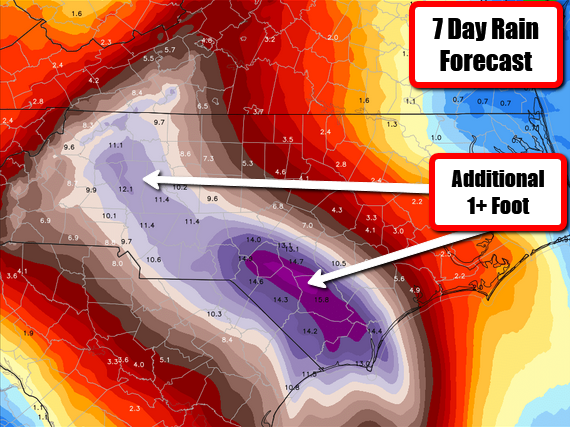 Due to the extreme rainfall expected to fall across the Carolinas and into parts of Virginia over the next several days – on top of what has already fallen across the region – major to extreme river flooding will be possible. In some areas, this river flooding could rival Hurricane Matthew from 2016 or Hurricane Floyd from 1999. Tornado Watch. The potential of a few tornadoes will once again exist today on the north side of the system. 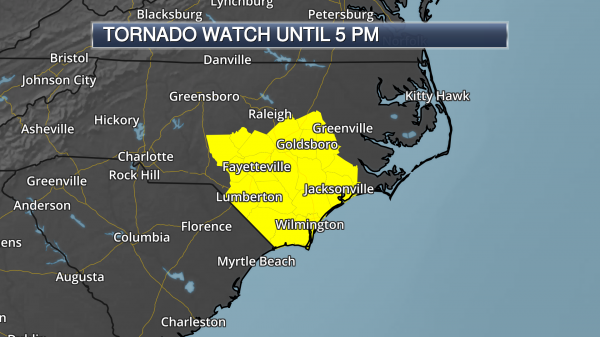 A Tornado Watch has been issued until 5 PM for areas like Wilmington, Jacksonville, Fayetteville, and Goldsboro.